Everything is calmer in the house, finally. ^^ Mom's getting around without a problem and she feels a lot better. So that's a lot off my shoulders. Yes, it was just gallbladder surgery but it makes me nervous when anyone's having to go back and forth to a doctor. If anyone's been watching this site for any amount of time, thanks for your patience! 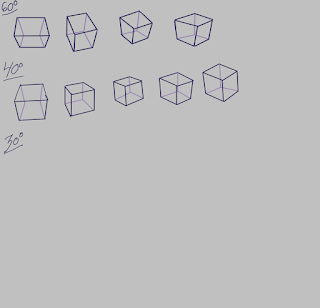 The idea is that these cubes are meant to be rotating like you saw in my last post or two. I forgot to draw a line under them to keep them even but that does not matter at all. It's imperfect but I can currently see where the boxes are trying to rotate! That thrills me. And it's so nice to be back to messing with homework like I should have been ages ago! Will finally get this bit done and get to go to my next lesson! Of course, I have to find distractions left and right. A friend of mine helped me figure out exactly why my Sims 2 game wasn't working--something between 8.1 and 10 must have deleted one of the important parts that the game needs. Had to restart from the beginning but that's not a problem. No, my trouble is that I want to play that game now. While I'm getting more work on my assignments. I'm ridiculous!